Are you new to the world of self-catheterization? Whether due to urinary retention, incontinence, neurogenic bladder, a spinal cord injury, or another medical condition requiring the use of a urinary catheter to drain your bladder, 180 Medical is here for you. We understand that it can feel somewhat unnerving for some people to start cathing for the first time, and that’s why we want to help you by explaining the basic components of an intermittent catheter. This can be a great start to feeling more confident and comfortable with the process as you begin to learn your own self-catheterization routine. Because everyone has a different body and different needs, we like to remind you that there is no one catheter out there that will work for everyone across the board. 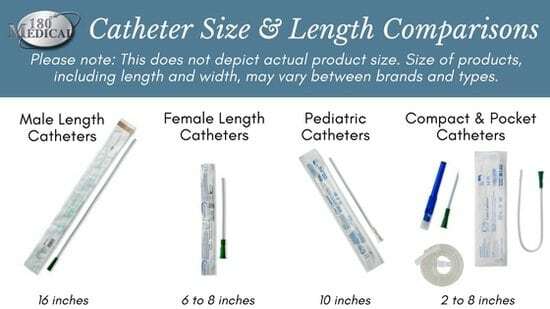 The same goes for the size, catheter type, and length of your catheter product. 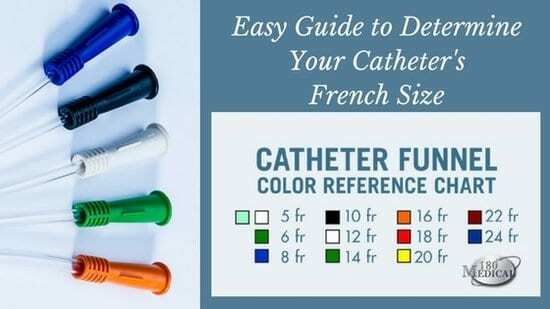 Catheters are sized by what is called “French sizes,” which refers to the diameter of the catheter tube. Most typically, sizes range from 5 Fr – 24 Fr. When you receive your first order of catheters, thanks to a universal color-coding system, you can tell the catheter’s French size by the color of its funnel end, unless it does not have a funnel or if the brand does not use color-coding for its funnels. With the right French size, urine should flow from your bladder at a timely pace while allowing the procedure to be performed free of discomfort and pain. A catheter that is too small will let urine flow around the sides of the tube, which can make quite a mess. On the other hand, you certainly don’t want a catheter that is too big for your urethra, which could cause discomfort and pain. Your doctor will select and prescribe the proper size with you, taking into consideration your preferences as well as your particular anatomy. Funnels are often attached to catheters for various reasons. As mentioned above, they are often color-coded for easy French size identification, depending on the brand and type of your catheter. Funnels are useful for gripping the catheter without touching the tube itself while directing the urine flow into a receptacle. Funnels are also designed to attach to drain bags, in case a urinal or toilet is unavailable. Catheters don’t always come with funnel ends, however. There is an option called a luer end, which comes just like a regular catheter (same features, same insertion tip) but without the funnel, leaving the end like an open tube. The choice between a catheter with a funnel or luer end is typically a matter of personal preference. Some people prefer having a funnel for easy size identification or easier gripping without touching the tube itself. The luer end catheters are sometimes preferred because the packaging may be smaller or more discreet due to the lack of a funnel. Male length catheters are usually 16 inches in length. Female length catheters range from 6-8 inches in length. range from 6-12 inches in length. Women and children generally use shorter lengths because of their shorter urethras, although some may prefer a male length catheter. There are also compact and pocket catheter options available for both genders. If you’re interested in a more discreet option like a pocket catheter, feel free to contact us and talk to one of our Catheter Specialists. Curious if your insurance covers catheters? We can verify your insurance plan for you to see if and how your catheter products may be covered. 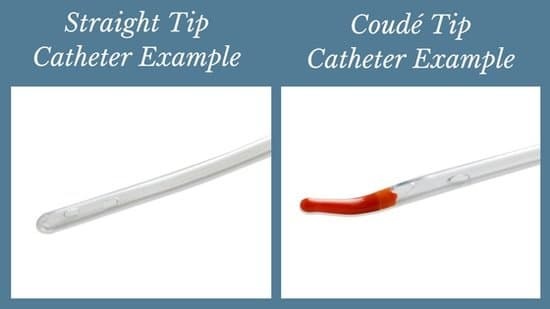 Catheters can have a straight tip or a coudé insertion tip. The most common insertion tip is the straight tip, which is the basic tip that will work for most people across the board. The coudé tip, also known as a curved or bent tip, is used most often when a blockage, enlarged prostate, or stricture makes the use of a straight catheter difficult or even impossible. This is most common in men, so the coudé tip is almost always on a male length catheter. Do you have any other questions about urinary catheters? You’ve come to the right place. At 180 Medical, we specialize in urethral catheter products, as well as ostomy supplies, so when you speak to one of our specialists, you know you’re talking to a catheter expert who will consider your needs and preferences as well as your doctor’s recommendations in helping you find an intermittent catheter that can be efficient and easy to use for you! Contact us today! Disclaimer: Please note that this is intended to provide a general understanding of the basics of intermittent catheters. It should not be used in place of any recommendations or instructions from your prescribing physician or other professional healthcare professional. Together, with your doctor’s office, 180 Medical can help you find a catheter that works for you.